Bring your look to the next dimension! This 10-shade palette blends different shadow textures to create a fresh and colourful look. It includes three matte shades, three satin shades, one cream shadow/liner, one cream illuminator and two sparkling top coats. 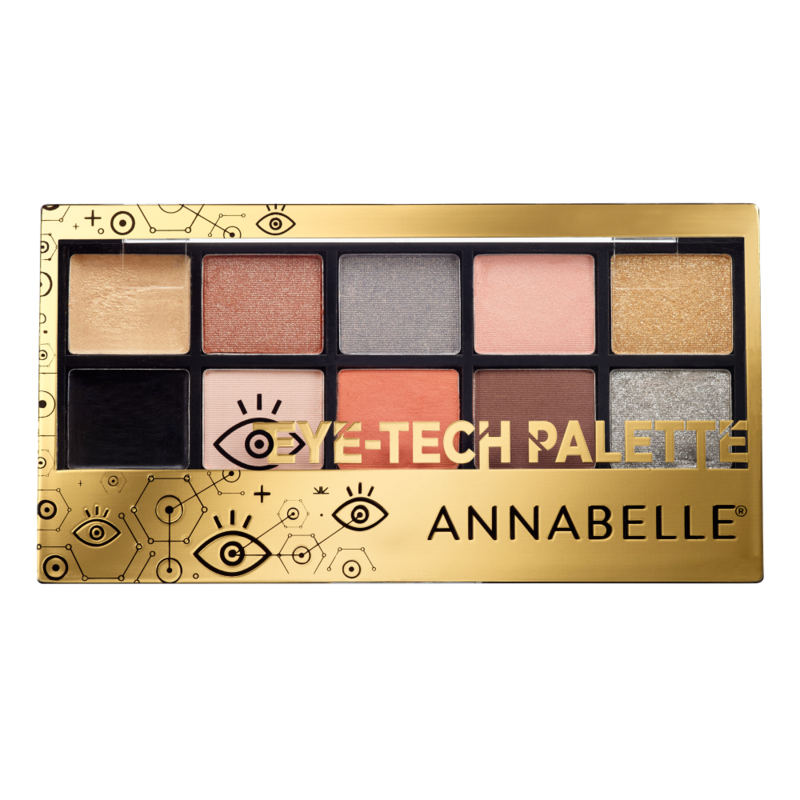 Apply Annabelle Eye Primer to increase the hold and intensity of the shadows. Apply one of the neutral colours as a base. Apply the cream illuminator to the inner corner of the eye and on the brow bone to enlarge the eye. Create a shaded effect by adding one or more intense colours from the palette. Intensify your look by drawing a line with the black shade. For a more glam effect, apply a glitter top coat. If you have blue eyes, create your look using warmer colours. Shades of grey are perfectly suited for green eyes. All shades can be used to bring out brown eyes. POWDER/POUDRE : TALC, MICA, SYNTHETIC FLUORPHLOGOPITE, POLYETHYLENE TEREPHTHALATE, DIMETHICONE, MAGNESIUM STEARATE, CAPRYLIC/CAPRIC TRIGLYCERIDE, CALCIUM ALUMINUM BOROSILICATE, CAPRYLYL GLYCOL, PHENOXYETHANOL. +/- TITANIUM DIOXIDE, IRON OXIDES, MANGANESE VIOLET, ULTRAMARINES. CREAM/CRÈME : ETHYLHEXYL PALMITATE, MICA, CERA CARNAUBA/COPERNICIA CERIFERA (CARNAUBA) WAX/CIRE DE CARNAUBA, OCTYLDODECANOL, SILICA, C12-15 ALKYL BENZOATE, ISOSTEARYL ISOSTEARATE, PHENYL TRIMETHICONE, BIS-DIGLYCERYL POLYACYLADIPATE-2, OZOKERITE, PEG-2 HYDROGENATED CASTOR OIL, SORBITAN ISOSTEARATE, TOCOPHERYL ACETATE, HYDROGENATED CASTOR OIL, CAPRYLYL GLYCOL, PHENOXYETHANOL. +/- TITANIUM DIOXIDE, IRON OXIDES.